Compartment in the base where an Anker USB Power Strip can be concealed (power strip options available at checkout). Cord Management Tools - molded clips, integral cable organizers, and/or slots cut in bottom & side. 20 different finishes wood/finish combinations. These links provide easy access to the product lines featured on our Etsy Store. Our Tech Bed Product line offers the widest range of sizes and configurations. Holds 2 - 8 phones and 1 - 10 larger devices. Special Configurations for Oversized/Gamer Laptops. 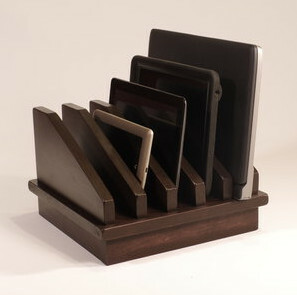 Tablet Hordes provides a place to safely collect your tablets, laptops, and other devices. Unique One of a kind "Knotty Tech Beds" feature the natural beauty found in highly figured wood. Several stylized landscape options are currently available. The Franklin Tech Park offers convenient access to charging cables for phones, tablets, and laptops. 3 - 4 Larger Devices in 3 bays - 1st two are 9.25" W - 1.75 D Last is 2" D .
These designs conceal a 4 outlet surge protector along with the Anker USB charger. Not Familiar With Etsy ? Etsy is an online market place that features handmade crafts, vintage items, and craft supplies. It is the initial sales outlet for makers from around the world. It offers shoppers a nearly endless marketplace, processes all payments, and posts reviews for each shop owner.